Out for lunch at The Cotton House. Glad we booked! First time we’ve been there and couldn’t get parked. Eventually found a space away round the back of the buildings. Had to walk for miles to get to the restaurant – slight exaggeration. I had Chicken noodle soup and Scamp had boring spring rolls. She had Chicken and Mushroom for a main I had the much more exciting Chicken with Ginger and Spring Rolls. It was good to have something other than our usual Chicken Chow Mien. Came home via Lidl to get some fruit and maybe some coloured pencils which somebody on 28DL had said were worth trying. Apparently the artists in Kilsyth had thought so too, because there were none to be seen. We still managed to buy much more than ‘some fruit’ and came out with two laden bags. Forgot to get my pills from Boots and petrol, so I went back out and returned by way of St Mo’s so I wouldn’t have to lug my tripod all the way from the house. 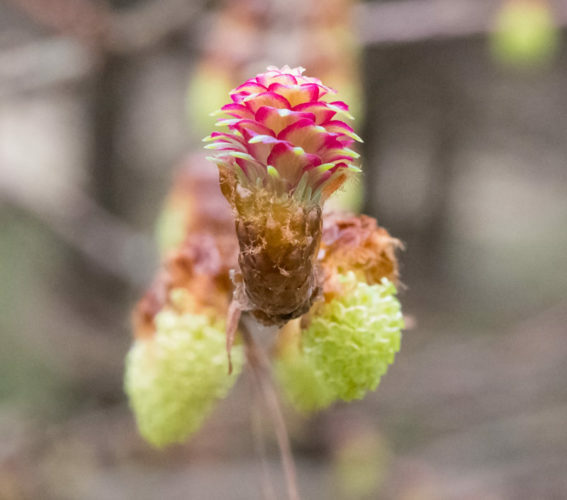 My target today was one of the larch flowers which are so difficult to catch shooting freehand. The tripod did make it easier, but because the flowers are at the end of the branches, they move in even the slightest of breezes. Captured one successfully and that became PoD. Basically, that was it for the day. Not the brightest day, the ISO the camera chose was 4000 which is quite high. A bit colder than usual too, but better to make the most of it because it looks like rain tomorrow. Scamp, June and Isobel are going to a matinee of Sister Act tomorrow and I’ve volunteered to be taxi driver. That should give me some free time in the afternoon to get an apple drawing done. First one was done today. You’ll have to believe me because I aint going to post it!